FuzeBlocks auxiliary power distribution / fuse Panels for motorcycles - the easy and safe way to add electrical accessories to your bike that makes the job a lot easier, a great solution whether you're a wiring novice or wiring expert. 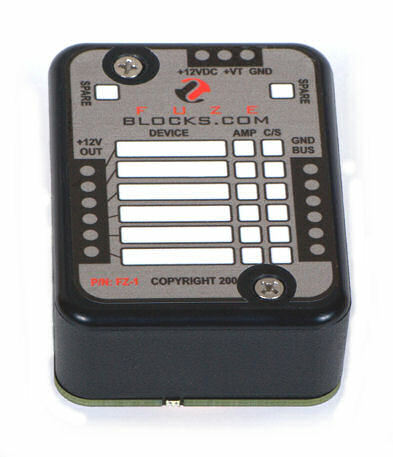 Fuzeblocks.com has designed a fuse block that is easy to install and fits into a small space. The on board relay offers the choice for any device to be switched on or off automatically with the vehicle ignition or to be powered constantly. With the FZ-1 in place you can power all kinds of motorcycle accessories including, but not limited to, auxiliary lighting, GPS, radar detector, CB/FRS/GMRS radio, heated grips, XM radio, audio mixers, intercom system and any other device requiring 10A or less. Any of these accessories can have constant or switched power by simply placing the fuse in the correct position for the power desired. Installation for the FZ-1 fuse block requires no crimping. All connections are made by heavy duty screw terminals that can accept up to a 12 gauge wire. All the FZ-1 needs is +12VDC, ground and a +12VDC switched source to make it fully functional. The unique board layout provides six individually fused circuits that can supply constant or switched power for each accessory depending on your needs. Check out all the features the FZ-1 has to offer and you'll agree that it makes powering your accessories easy. Is the FZ-1 Safe For CanBus (BMW) Systems? Yes. The main issue with the CANbus system is its susceptibility to transient voltages. A standard relay has a coil and when the electrical field on that coil collapses the energy needs to go somewhere. The voltage travels back through the wiring and, if not blocked, to the bike. The FZ-1 provides two diodes to prevent this from happening. Both diodes provide protection ensuring that any transient voltages are sent to ground or blocked from traveling back into the bike wiring. Hole centers for mounting standoffs: 2.65" x 1.78"
Contributions towards the running costs of this website will be very much appreciated.